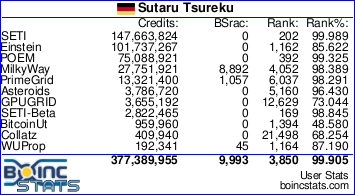 After only SETI being down last night, both SETI and BOINC are down currently. I just checked my main cruncher and the queues are full at this point in time. So I'm not sure what is really down aside from the main site. Is SETI@home really still in 'maintenance mode'? Or something at my end is broken? I switch on my dual Xeon with quad R9FuryX ((maybe?) just for the upcoming 'SETI.Germany Wow!-Event 2017' which start in ~ 5d:20hrs), and now since yesterday ~ 23:30 the GPUs, since ~ 05:00 the CPUs idle. How can my PCs make much pending credits of results? This happened before not to long ago. We will have to wait til 5 PM or so i guess. Jeff posted in the Panic mode thread that it was his fault. No big deal, we are all humans.